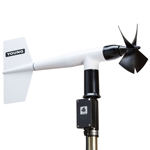 The 200-05103 Wind Monitor is a high resolution wind speed and direction sensor. 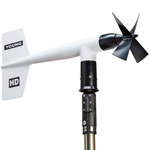 Its simplicity and lightweight corrosion resistant construction make it well suited for a wide range of wind measuring applications. 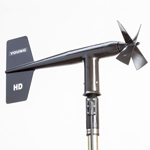 The wind sensor is a four blade helicoid propeller. 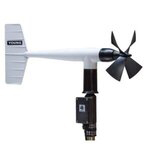 Propeller rotation produces an AC sine wave voltage signal with frequency directly proportional to wind speed. Slip rings and brushes are not used, resulting in improved reliability and lower cost. The wind direction sensor is a rugged yet lightweight vane with a sufficiently low aspect ratio to assure good fidelity in fluctuating wind conditions. Vane position is sensed by a precision conductive plastic potentiometer located in a sealed chamber. With a known excitation voltage applied to the potentiometer, the output signal is directly proportional to azimuth angle. An orientation ring is supplied for preserving wind direction reference when the instrument is removed for maintenance. The instrument is made of UV stabilized plastic with stainless steel and anodized aluminum fittings. All bearings are stainless steel precision grade. Transient protection and transducer terminations are in a convenient junction box on the mounting post. The instrument mounts on standard 1 pipe. 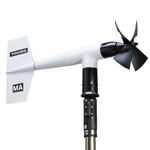 For offshore and marine use, the 200-05106 Wind Monitor-MA offers the added features of special bearing lubricant and sealed heavy duty cable pigtail in place of the junction box. 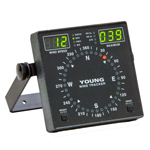 The 200-05603 Wind Sensor Interface provides calibrated wind speed and direction voltage output signals. Low power circuitry makes it ideal for field studies and remote data-logging applications. The 200-05631 Wind Line Driver provides separate 4-20 mA two-wire current loops for wind speed and direction. The unit is able to drive lines up to several km long and operate in high noise areas. Both the sensor interface and line driver operate over a wide temperature range and include protection from high voltage transients. The units are supplied with a universal mounting bracket for convenient mounting near the Wind Monitor. AC voltage, 3 pulses per revolution. *Nominal values, determined in accordance with ASTM standard procedures.